Over the last few years Instagram has rapidly grown in popularity and is now considered to be one of the most popular image sharing apps worldwide. It provides users with a platform to upload pictures and videos from their smartphone/tablet which show moments in their lives that can be instantly saved and shared with friends, family and the wider public. Instagram also allows users to search for images related to specific topics by using hashtags. Simply add # before the topic you are looking for (e.g. #type1diabetes or #carbcounting) and you will be presented with a variety of images and videos. You can also add descriptions to your uploads to explain the meaning behind the picture/video. 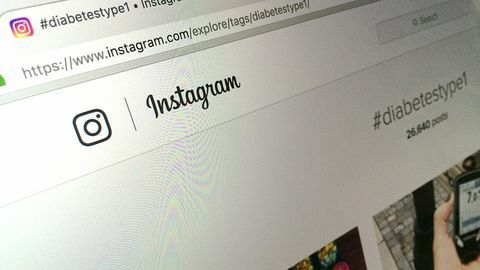 If you would like to use Instagram to look for diabetes related images or videos, or to upload your own, all you need to do is set up an account (this can be a public or private account – you decide). You can then search for hashtags related to diabetes, these will also direct you to diabetes related Instagram accounts. You can choose to ‘follow’ these accounts in order to see all of the images they upload on your home feed. You can also share your images/videos that you have uploaded to Instagram on other social media platforms such as Twitter, Facebook, Tumblr and Flickr. This will help you to reach a wider audience and to engage with more people who have similar interests to you.